DEFT® Interior Clear Waterborne Acrylic Wood Finish is an interior self cross-linking acrylic that embodies the quality of the DEFT® Interior Clear Brushing Lacquer in a water based formula. Today’s professionals and DIYers alike continue to appreciate the ease of use, excellent durability and mar resistance. 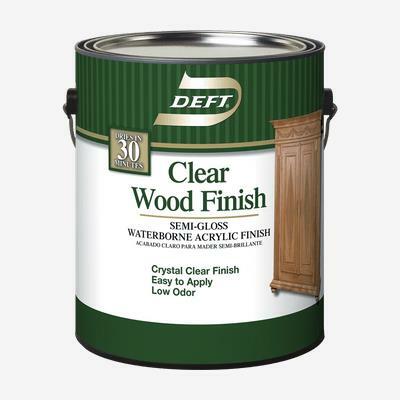 DEFT® Interior Clear Waterborne Acrylic Wood Finish is ideal for stained or bare wood surfaces including furniture, doors, cabinets, trim, paneling, and molding.